Citation: Gopal Nayak, Mahendra Kumar Trivedi, Alice Branton, Dahryn Trivedi, Snehasis Jana (2018) Assessment of Energy of Consciousness Healing on Cell Growth of Plant Stem Cells Callus Culture . International Physiology Journal - 1(2):15-23. The present study was aimed to evaluate the effect of Consciousness Energy Healing Treatment on plant callus of Mandukparni (Centella asiatica), Katsarika (Barleria cristata), and Amla (Phyllanthus emblica) in Murashige & Skoog liquid medium (MS) for its growth and yield on day 7. The plant callus of all the three plants were divided into two parts, one part received Biofield Energy Treatment remotely (known as The Trivedi Effect®-Energy of Consciousness Healing Treatment) by a renowned Biofield Energy Healer, Gopal Nayak and denoted as Biofield Energy Treated group, while another part did not receive any treatment and defined as control. Plants callus were observed on day 7 after treatment and visualized under phase contrast microscope for cell growth, captured photomicrographs along with wet weight compared with day 0. Results suggested that three plants viz. 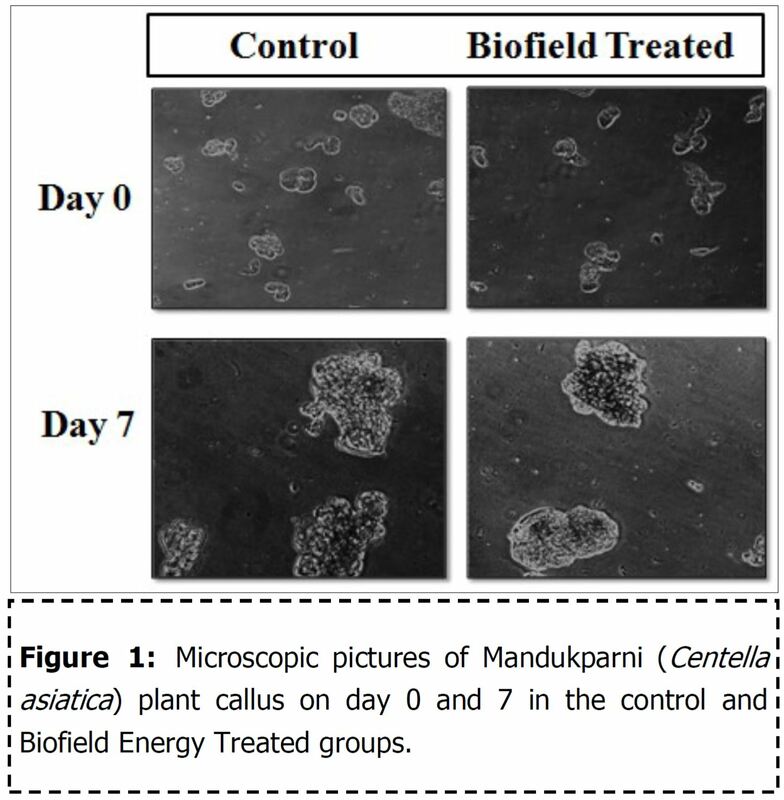 Mandukparni, Katsarika, and Amla callus after 7 days showed a significant improved growth rate as compared with the respective untreated groups. The weight of the callus growth (in mg) after Biofield Energy Treatment among Mandukparni, Katsarika, and Amla callus on day 7 was 630, 782, and 920 mg, respectively. However, the percentage increase in weight of the callus in Mandukparni, Katsarika and Amla was 11.1%, 52.4%, and 68.5%, respectively than untreated. Hence, results concluded a significant growth in callus weight after Biofield Energy Treatment, which suggested that it could be used as complementary and alternate approach in order to produce most high-value phytoconstituents from plant callus that can be used for making various drugs, food flavoring and colouring agents. Plant tissue culture also defined as cell culture, sterile culture, in vitro, and axenic is one of the vital tool now a days in basic and applied science research studies, which have been implicated in various commercial application . Under defined in vitro physical and chemical conditions, plant cell tissue culture is maintained in an aseptic conditions from cells, tissue, organ, and their associated components. These cultures are very useful for commercial applications for its secondary metabolites, which can be directly used as drug or as one of the major constituents of medicinal agent. The plant callus cultures are one of the best methods for the conservation of medicinal plants, which provide high-value natural products (NPs) such as codeine, nicotine, strychnine, azadirachtin, morphine, and paclitaxel . Besides, they are also used as flavoring and coloring agents using various approved commercial methods. Chemical synthesis of metabolites is one of the alternative and costly approaches, which is also associated with the toxic by-products . Thus, plant tissue culture can be considered as the best approach and well-established platform for NPs synthesis with various advantage and wide therapeutic application [4, 5]. The present experimental study assessed the growth and yield of plant callus of Mandukparni (Centella asiatica), Katsarika (Barleria cristata) and Amla (Phyllanthus emblica) after treatment with The Trivedi Effect®-Energy of Consciousness Healing Treatment by a renowned Biofield Energy Healer, Gopal Nayak. Centella asiatica L. also known as Indian pennywort, it has been reported for multiplication of its callus through shoot tip culture  and meristem tip culture . Besides, this plant has significant benefits used for asthma treatment, skin diseases, nervine tonic, hypertension, dropsy, bronchitis, and urethritis (inflammation of the urethra) . Phyllanthus emblica Linn. (Indian gooseberry or amla) significantly used as alternative medicine in order to boost the vitality and vigor, along with its significant action as anti-inflammatory, wound healing, antianemia, cardioprotective, antipyretic, anti-diarrheal, analgesic, and many more . Similarly, Barleria cristata, a perennial shrub has been reported to have many biological active compounds viz. iridoids, flavonoids, and phenylethanoid derivatives against many biological activities . The potential mechanisms of certain Energy-Healing practices have been increased from many decades in different biological fields. As a result, healing practitioners (The Trivedi Effect®) have been involved in a wide number of preclinical, in vitro cell lines, analytical, pharmaceutical, agricultural studies. Complementary and Alternative Medicine (CAM) has also defined and recognized Biofield Energy Healing with significant results in biological studies . National Center for Complementary and Alternative Medicine (NCCAM) also mentioned about the importance of Biofield therapies in the subcategory of Energy Therapies. Hence, Biofield Energy Healing is increasingly accepted to promote human wellness as an alternate approach [12, 13]. The Trivedi Effect®-Consciousness Energy Healing Treatment has been reported with significant revolution in the physicochemical properties of metals [14-17], improved agricultural crop yield, productivity, and quality [18-20], transformed antimicrobial characteristics of pathogenic microbes at genetic level [21-23], improved biological activity of nutraceutical compounds for skin health [24, 25], livestock , biotechnology [27, 28], improved bioavailability [29-31], nutraceuticals [32, 33], cancer research [34, 35], bone health [36-38], human health and wellness. The liquid MS medium (Murashige Skoog's) was purchase from Sigma-Aldrich, India. Serological pipettes and T75 culture flask were procured from Thermo Scientific, while the culture petridish and 200 μL microtips were purchased from Tarson, USA. All the other chemicals used in this experiment were analytical grade procured from India. The three plant callus was taken in the experimental group’s viz. plant callus of Mandukparni (Centella asiatica), Katsarika (Barleria cristata), and Amla (Phyllanthus emblica). For experimental testing, each callus culture and plant MS media were divided into two parts, one is control and other is the Biofield Energy Treated. All the groups were visualized for growth and yield of the callus on day 0 and day 7. The test samples, three plant callus and MS media were divided into two parts, one part each of the test sample (plant callus and MS media) was treated with the Biofield Energy by a renowned Biofield Energy Healer (also known as The Trivedi Effect®) and coded as the Biofield Energy Treated DMEM, while the second part did not receive any sort of treatment in the control test sample (plant callus and MS media) group. This Biofield Energy Healing Treatment was provided by Gopal Nayak remotely for ~5 minutes, while the test item was located in the research laboratory of Dabur Research Foundation, New Delhi, India. This Biofield Energy Treatment was administered for 5 minutes through the Healer’s unique Energy Transmission process remotely to the test sample under laboratory conditions. Gopal Nayak in this study never visited the laboratory in person, nor had any contact with the test sample (plant callus and MS media). Further, the control groups were treated with a sham healer for comparative purposes. The sham healer did not have any knowledge about the Biofield Energy Treatment. After that, the Biofield Energy Treated and untreated samples were kept in similar sealed conditions for experimental study. After that, the Biofield Energy Treated and untreated samples were kept in similar sealed conditions for experimental study. Healthy leaflet of the mandukparni, katsarika, and amla explants were collected in appropriately sized. All the three explants were thoroughly washed using running tap water for 20 minutes in order to remove the traces of dust, foreign materials, etc. followed by washing with the fungicide solution. Further, the explants were exposed to surface sterilization using 70% ethanol for about 40 seconds and again washed 4-5 times using sterile double distilled water. All the three fine cuts were made in the young leaf (wound induction), which were cultured on MS basal medium, gelled with 0.8% agar containing 3% sucrose. The pH of the callus medium was adjusted approximately 5.8 before agar was gelled. All the plant callus cultures were maintained in growth condition at 25 ± 2º C and 60% to 70% relative humidity with a photoperiod of 16 hour at 3000 lux light intensity with a photoperiod of 16 hour light and 8 hour dark. All the three cultures were incubated in a culture room and after some days, callus induction was started in all the samples. Further, the suspension culture was made from the friable creamish calli, which was transferred to the T75 culture flasks in liquid MS media supplemented with different phytohormones such as cytokines (6-benzylaminopurine, BAP with 5.0 mg/L and kinetin, KIN with 0.5 mg/L concentration) and auxins (α-naphthalene acetic acid, NAA with 2.0 mg/L and 2,4-dichlorophenoxyacetic acid, 2,4-Dwith 2.0 mg/L). The aliquots of mandukparni, katsarika, and amla stem cells were cultured in T-75 cell culture flasks. The flasks received Biofield Energy Treatment (known as The Trivedi Effect®) at this stage without touching the cells. Following the treatment, the above T-75 flasks were incubated till day 7 in a shaking incubator (120 rpm) under photoperiod of 16 hours at 3000 lux light intensity provided by cool white fluorescent tubes. The incubation conditions were similar to that of untreated cells. On day 7, the flasks were observed and visualized under phase contrast microscope for monitoring cell growth and photomicrographs were captured at 200X magnification. The wet weight of all the callus was taken after day 7 .
weight was 620 and 630 mg, respectively. The weight increase in untreated group was 297 mg, while Biofield Energy Treated group showed a weight increase of 330 mg. Overall, the data showed 11.1% increased in the plant callus growth on day 7 after Biofield Energy Healing Treatment as compared with the control group. The experimental data suggested the significant callus growth, which have been used for many biological activities such as antioxidant, anti-feedant, anti-leprotic, antibacterial, and anti-tuberculosis activity along with significant use in leprosy and tuberculosis due to the presence of brahminoside, asiaticoside, indocentelloside, brahmoside, and theankuniside [40-42]. Biofield Energy Treatment showed an improved callus growth of Centella asiatica, which can be used against many biological disorders. Overall, the experimental data assumed that The Trivedi Effect® has significant capacity to improve the callus growth that can be used for isolation of biological active constituents, which have wide application against various pharmacological activities. 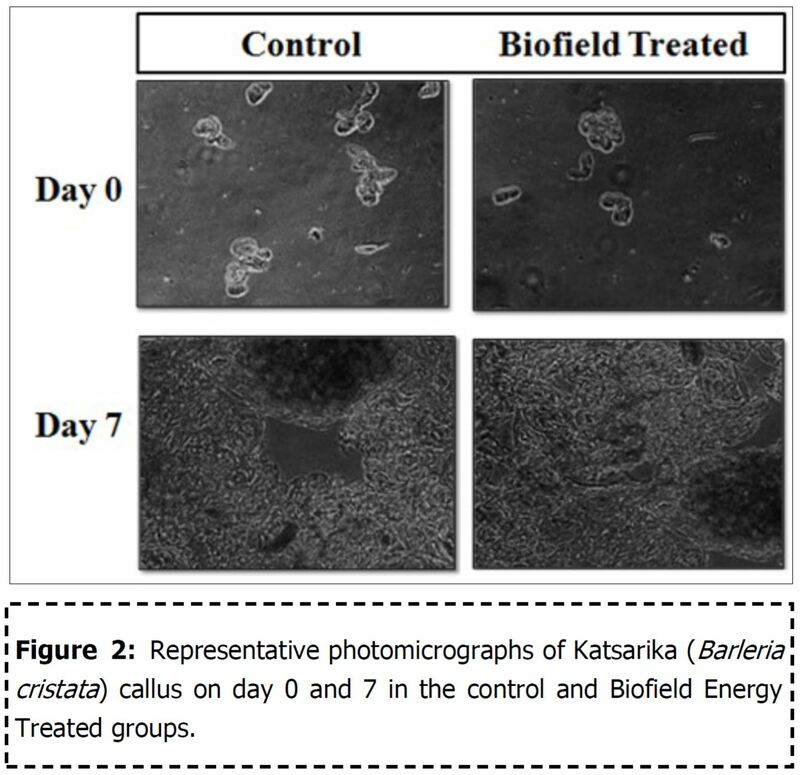 Katsarika plant callus growth and yield after Biofield Energy Healing Treatment by a renowned Biofield Energy Healer, Gopal Nayak showed a significant growth and the results are presented in Figure 2. Katsarika callus flasks were observed and visualized under phase contrast microscope for cell growth and photomicrographs were captured at 200X magnification on day 0 and day 7. The plant callus at day 7 as presented in the Figure 2, showed a significant growth after Biofield Energy Treatment, while the callus growth was high on day 7 as compared with the untreated plant callus and MS media. The experimental data revealed that the katsarika weight of callus (day 0) in the untreated group was 290 mg, while it was 302 mg in the Biofield Energy Treated group. On the other hand, on day 7 the katsarika weight of callus in the untreated group was 605 mg, while it was 782 mg in the Biofield Energy Treated group. The weight increase in control group was 315 mg, while Biofield Energy Treated group showed a weight increase of 480 mg. Overall, the data showed 52.4% increased in plant callus growth on day 7 as compared with the untreated control (day 0). The results suggested that Biofield Energy Healing Treatment has significant capacity to improve the plant callus of Barleria cristata. Thus, it can be used against isolation of vital phytoconstituents like iridoids, flavonoids, and phenylethanoid derivatives . 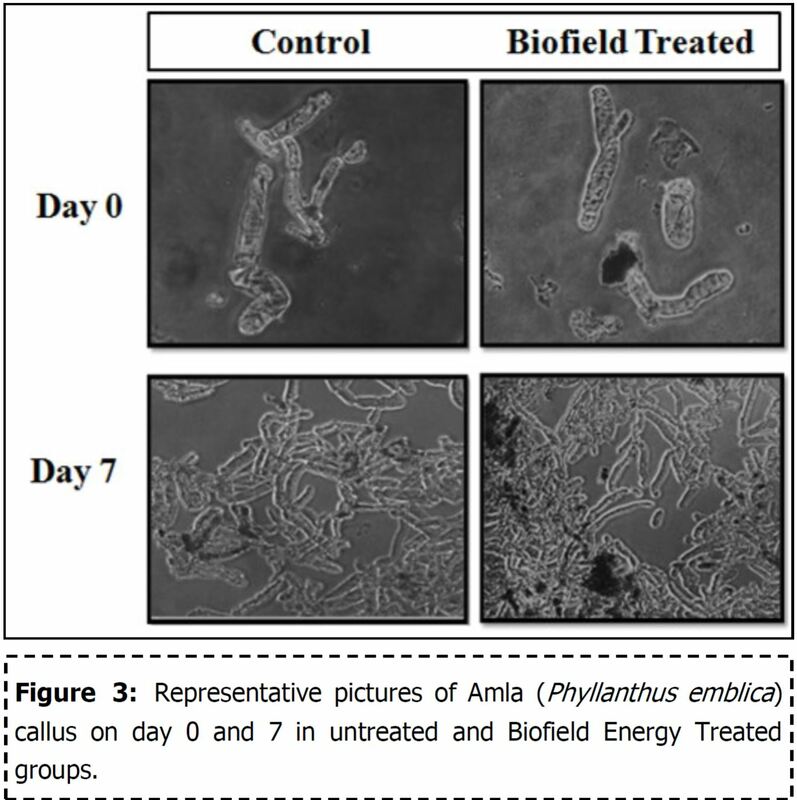 The results of Amla plant callus growth and yield after Biofield Energy Healing Treatment are presented in Figure 3. Amla callus flasks were observed and visualized under phase contrast microscope for cell growth and photomicrographs were captured at 200X magnification on day 0 and day 7. The plant callus at day 7 showed a significant improved callus growth after Biofield Energy Treatment as compared with the untreated plant callus. However, results suggested that the amla plant callus weight in the untreated group was 403 mg, while it was 369 mg in the Biofield Energy Treated group on day 0. On the other hand, on day 7 the amla callus weight in the untreated group was 730 mg, while it was 920 mg in the Biofield Energy Treated group. The weight increase in control group was 327 mg, while Biofield Energy Treated group showed a weight increase of 551 mg. Overall, the data showed 68.5% increase in amla plant callus growth as compared with the untreated control. Phyllanthus emblica is one of the best dietary sources of vitamin C, amino acids, and minerals. It contains emblicol, phyllembelic acid, phyllembelin, rutin, curcuminoids, phenolic compounds and tannins as the major constituents for various biological activities. Biofield Energy Healing Treatment showed a significant improved growth of plant callus, which can be highly useful to isolate the important phytoconstituents. Amla has been reported with significant biological activities such as antidiarrheal, antitussive, analgesic, hepatoprotective, wound healing, anti-atherogenic, anti-atherosclerotic, adaptogenic, gastro-protective, anti-hypercholesterolemia, nephron-protective, and neuroprotective properties [43-45]. Overall, the comparative data of all the three plants after treatment with The Trivedi Effect®-Energy of Consciousness Healing Treatment showed a significant increased in plant callus weight of Mandukparni (Centella asiatica), Katsarika (Barleria cristata) and Amla (Phyllanthus emblica). However, Centella asiatica, Barleria cristata, and Phyllanthus emblica showed a significant improved callus weight by 11.1%, 52.4%, and 68.5%, respectively on day 7 as compared with the day 0 (Figure 4). Plant callus can be used against many biological activities using their vital phytoconstituents. The present study concluded that Biofield Energy Healing Treatment has significant capacity to improve the growth and yield of Mandukparni, Katsarika, and Amla. The Trivedi Effect®-Energy of Consciousness Healing Treatment on plant callus of all the three plants, which showed a significant improved growth of callus cultures as observed by phase contrast microscope. The weight increase in control group of Centella callus was 297 mg, while Biofield Energy Treated group showed a weight increase of 330 mg. The weight of the Centella callus was 620 mg, while it was increased by 630 mg (11.1% increased) on day 7 as compared with the untreated Centella callus. The weight increase of Barleria cristata callus in control group was 315 mg, while Biofield Energy Treated group showed a weight increase of 480 mg. Katsarika (Barleria cristata) callus weight was 605 and 782 mg in untreated and Biofield Energy Treated sample, which showed 52.4% improved callus growth on day 7. The weight increase in control group of Phyllanthus emblica was 327 mg, while Biofield Energy Treated group showed a weight increase of 551 mg. 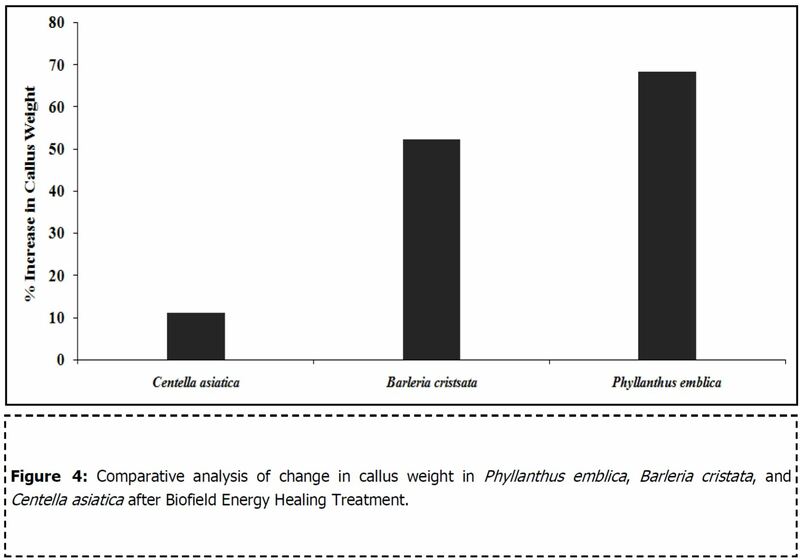 In addition, the callus weight of Phyllanthus emblica in the control group was 730 mg, while it was significantly increased to 920 mg after Biofield Energy Treatment on day 7. The experimental data suggested that the percentage increase in callus weight of Phyllanthus emblica was 68.5% as compared with the untreated group. Overall, data suggested that Biofield Energy Healing Treatment by a renowned Biofield Energy Healer, Gopal Nayak has the significant capacity to improve the growth of plant callus, which can be used to isolate the natural products from different medicinal plants and used as anti-inflammatory, immunostimulant, adaptogenic, hepatoprotective, and significant healing potential against various inflammatory diseases. Besides, The Trivedi Effect® can be used against several applications such as medicines, dyes, fragrances and flavors in pharmaceutical, cosmetic, and food industries. 1. Thorpe, T. A. (1990) The current status of plant tissue culture, in Plant Tissue Culture: Applications and Limitations (Bhojwani, S. S., ed. ), Elsevier, Amsterdam, pp. 1–33. 14. Trivedi, M.K. , Tallapragada, R. M. (2008) A transcendental to changing metal powder characteristics. Met. Powder. Rep. 63, 22-28, 31.